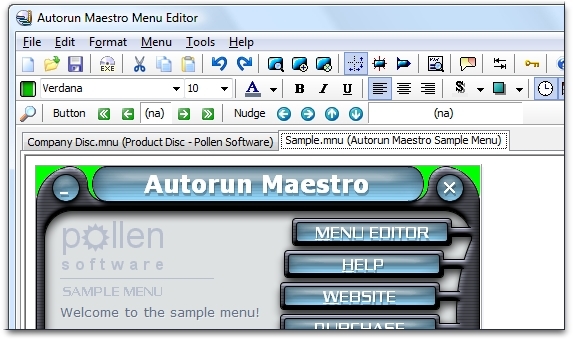 Autorun Maestro is highly configurable CD Autorun menu software. With a fully graphical interface, the Autoplay menus appearance and shape can be completely user configured with independently placed buttons, freely shaped forms, the ability to show the current time or date, skinnability and transparency, settable tab order and keyboard shortcuts, command searching, button animation and more. ...... if installation is required to view a CD document. Your Autorun/Autoplay menu can be optionally 3D skinned with StyleSkin. The easy-to-use Menu Editor has a multi-document interface, undo and redo, intelligent button placing, a full Button Command Wizard, allows for the use of commandline arguments and even compiles your menus into a single application! The buttons on your menus can perform many tasks, including launching programs or opening Internet Sites, directories in Explorer, sub-menus, creating a pre-addressed email; open documents or files (or anything else that you could imagine placing on a CD) in the User's viewer. Simply 'drag and drop' your PDF files and then create PDF autorun CDs! Qweas is providing links to Autorun Maestro 7.1 as a courtesy, and makes no representations regarding Autorun Maestro or any other applications or any information related thereto. Any questions, complaints or claims regarding this application Autorun Maestro 7.1 must be directed to the appropriate software vendor. You may click the publisher link of Autorun Maestro on the top of this page to get more details about the vendor.